Dieses Mal habe ich in Bautzen auf den Wendischen Kirchhof ein Panorama fotografiert. Der sonst belebte und bei Touristen und Einheimischen beliebte Platz war wegen der sommerlichen Hitze von 34° fast leer. So konnte ich ungestört in ca. 45 Minuten das Panorama fotografieren. This entry was posted on 12. Juli 2010. It was filed under sphärische Panoramen and was tagged with sphärische Panoramen. Very fine work. 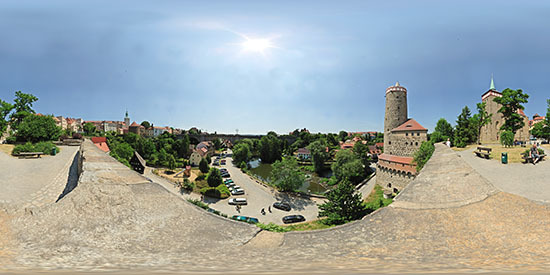 I am interested to know with this pano (Bautzen – Wendischer Kirchhof) how you keep the focus in both near and far distance? I can’t imagine how you got the distance views with just a 50mm lens. I am new to 360 panorama photography but quite familiar with stitching hi resolution images. I would appreciate your feedback. Thank you.